I had two other manufacture systems prior to this one, and on comparison, the Defender system's quality and options are so much more superior. I am very impressed with this product. Wireless system was purchased as back-up for wired system already installed. I had a break-in and the DVR on the wired system was stolen, eliminating all evidence. It would be great if these systems allowed the use of a shadow DVR, wired with Cat 5 (or similar), to create a back-up copy in a remote location. Infrared video is grainy, but adequate. Otherwise, overall quality of both systems is excellent. I have had two other security systems and the Defender is by far a more superior product. I especially enjoy the long power cords for each camera and the pairing of each was very easy. This system has more capabilities than I expected. Perfect Product. Good quality of major components. Cables connecting routers to the DVR could be longer to allow greater setup flexibility. Most of the setup is intuitive. This system works for us!! We bought our system last April, finally got around to putting it up. Super easy installation, and so far everything is great. Still learning how to work with all the features. Night vision is great, works better than we expected for the price. Only wish we would have bought the 6 camera system. Feel safer with Defender!! Great picture quality, on iPhone too. Had to buy some extra cables and get help from our "techie" son-in-law for set up. GREAT pictures, able top locate cameras in crucial places, I love having it on iPhone too!! Feel a lot safer with Defender!! This is best system I have worked with and I am hoping it will hold up for several years to come. Buy one today. Did have a couple of problems setting up but finally got to talk to someone on live chat. They got me started and everything seems to be working well now. Picture s are clear and night vision is good. Great value for the money. Good system for a home application. Fairly easy to put together and set up. Cables between routers and DVR could be longer to allow greater router height and separation from the DVR. Customer Service inquiry was answered quickly and completely. 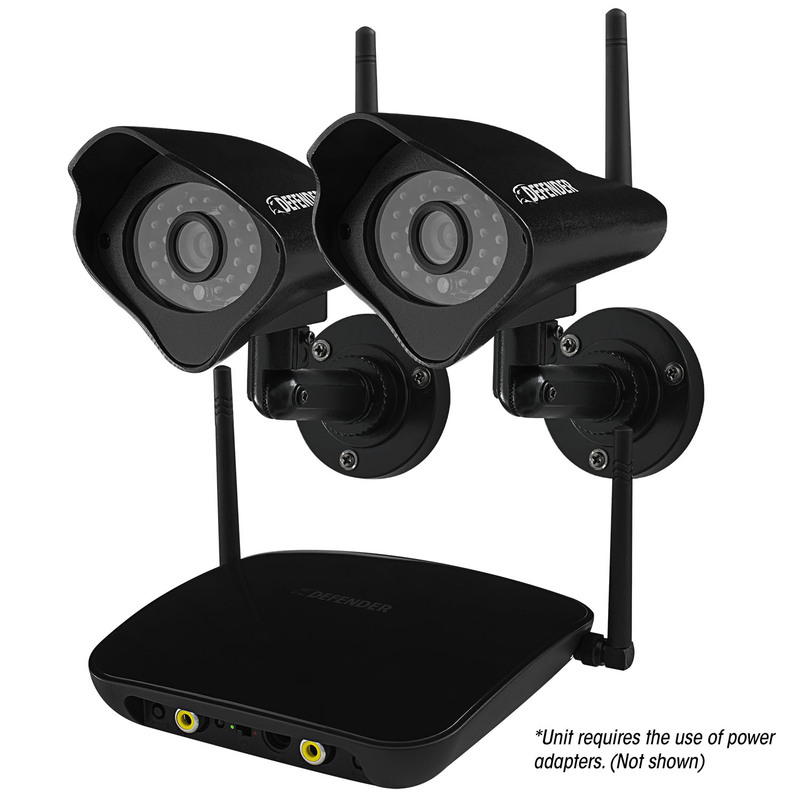 This system is perfect for what i need, i have a camera on all 4 entry ways to my house. Day or night nithing gets by me. Night time vision is really good, day time is just like bein outside, very plain. Easy set up, finding a plug in for each camera is tricky but thats the only problem i had. Love it, highly recommend this system.